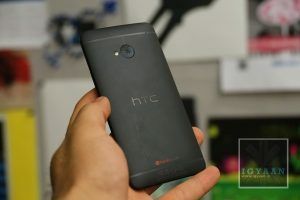 HTC has been flirting with Android phones from the beginning of the Ecosystem, But they only recently picked up pace thanks to the HTC One Series. 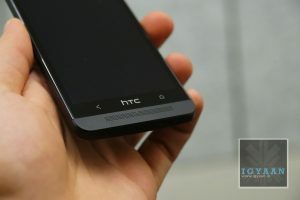 The new HTC One, also referred to as the M7 is a beginning of a whole new design philosophy for the company. 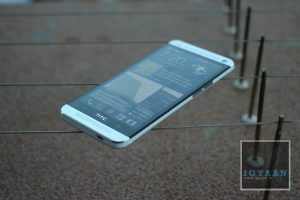 Does the HTC One feature all that is required to be the king of the robotic Jungle? Lets Find out. [pullquote_left]Ecstatic Expression on your Face! 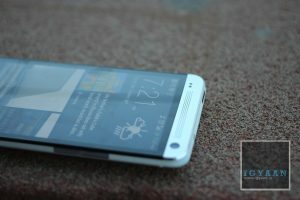 [/pullquote_left]From the moment you handle the HTC One for the first time, you get this ecstatic expression on your face, you are wow’d by the design and simply amazed by the display. 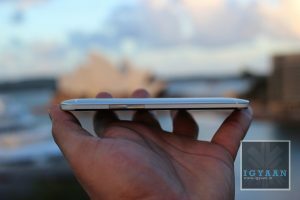 A shiver passes through your hands as you feel the Unibody design fit inside you hand almost perfectly as if it was designed for it. The HTC One is cast from a single shell unibody Aluminum block, that curves at the back but is flat in the front. 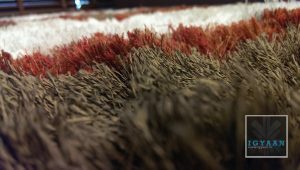 The two network bands that run across the back add network strength and aesthetic value to the complete mixture. 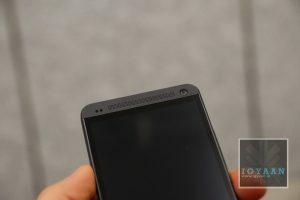 Also embedded in the back is a subtle HTC logo. The build, although very tough and robust, feels very damage friendly. 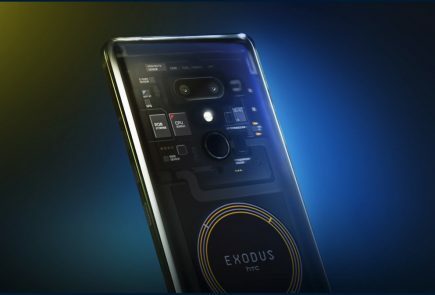 The front has Gorilla Glass 2 , but does not have a lay on the table design, in other words if you lay the phone on the screen, the glass will touch the surface that you lay the phone on. 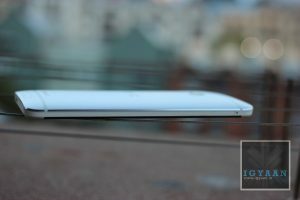 The phone seems so metallic in-fact, that every time you hold it, you worry about it getting dented, if you nick it against a door or a table edge. 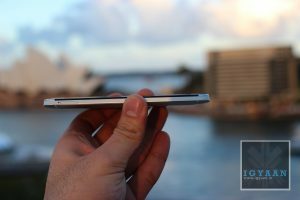 The fear quickly goes away as you start to use the phone and realize how tough, and scratch resistant the back of the phone is. 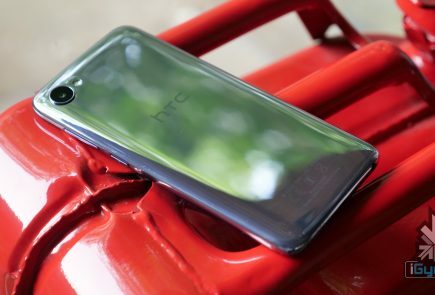 The Design strategy infuses the technology they learnt in making the HTC Windows Phone 8 and a mix of their research and experience with metals in the past with their Desire series. 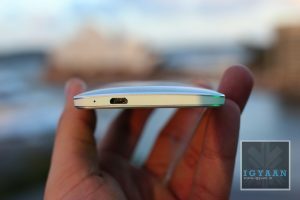 The HTC One is a perfect balance, of build quality, design, aesthetic and that wonderful Awe factor it causes in you everytime you pick it up. [pullquote_left]right fuse of external and internal[/pullquote_left]HTC has packed the HTC One with just the right amount of specs. 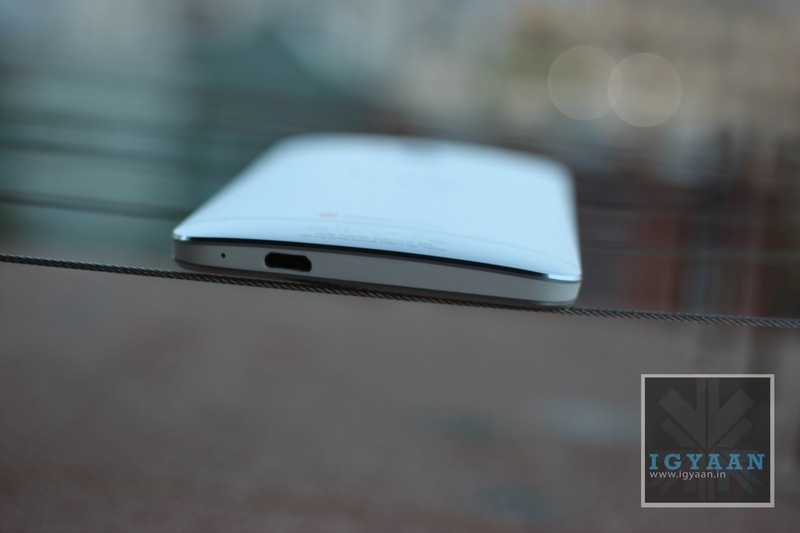 Even when a product can never be ahead of technology, the HTC One is a right fuse of external and internal technology. 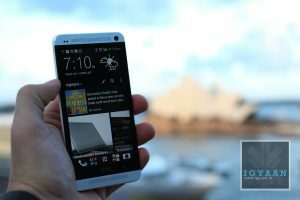 Powered by a 2300 mAh non – replaceable battery, the HTC One carries a Qualcomm Snapdragon 600 Chipset with a wonderfully snappy QuadCore 1.7 GHz CPU. The Graphics are provided by a Adreno 320 GP which remains superior in terms of Mobile Graphics rendering. 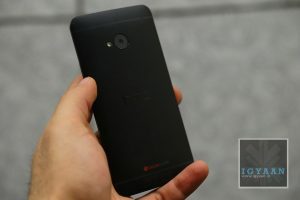 This intense capability is supported by 2GB of RAM and 32 or 64 GB of storage. 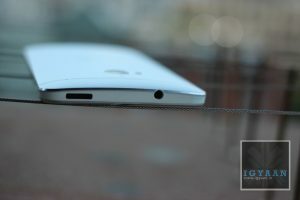 The Back features an Ultrapixel Camera which has a larger pixel size, making it sufficient at just 4 MP, and the front features a 2.1 MP snapper, both capture full HD video. The main camera is also assisted by an LED flash. The Gorgeous front features a 4.7 inch 1920 x 1080p IPS LCD 3 display with an intense 469 ppi making is one of the highest pixel density phones in the market. 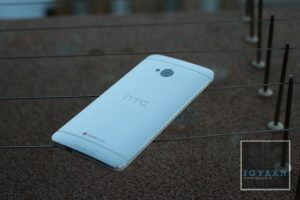 Ultrapixel is a word that does not exist in the dictionary, or at least that was the case before the HTC One. 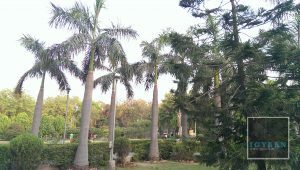 The camera comprises of a larger sensor and a larger size of the pixels that combine together to form the sensor. The camera combined with the software on the inside of the HTC One the is able to capture extremely high detail in an image. 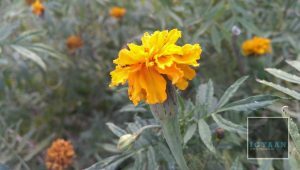 The large sensor and pixel size also opens up the sensor to low light subjects, allowing for better image quality in dim lighting conditions. 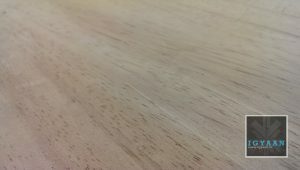 The images come out extremely sharp to about a 8×12 inch size, post which you will see degradation of the images. 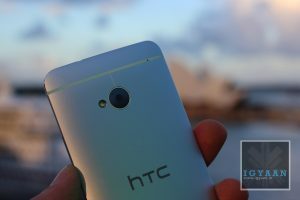 We found that the Video Captured by the HTC One is wonderfully vivid and captured without any stutter, rolling shutter was at a minimum and almost no aliasing was seen in the video. The Autofocus keeps jumping in and out during video especially if you are close to your subject, this can be painfully bothersome while recording or even while playing back. This is however fixed by turning off Continuos AF during video capture at the cost of loss of focus. The HTC Zoe feature within the camera is a wonderful add on, not only does it create beautiful timelines and videos demonstrating your photo groups it also allows you to modify pictures, remove photo bombers, and a lot more. This truly enables a social sharer to stay on top of his game adding just a right amount of usefulness. 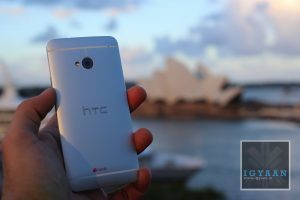 We did a comparison of the cameras of the top smartphones, and HTC One performed excellently well in low light and landscape capture. 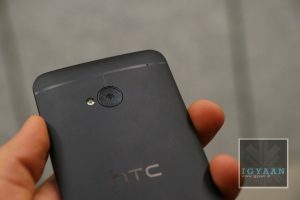 Here is where we begin to applaud HTC again, whether the BlinkFeed UI is useful or not, HTC with their new ONE has attempted to totally change the norm. 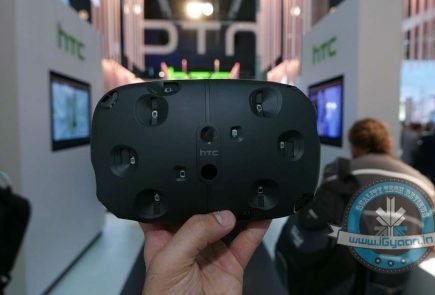 While most companies just upgrade the UI, HTC revamps it time and again. They changed it with Sense 4.0 and now they changed it again with the new BlinkFeed on Sense 5.0. 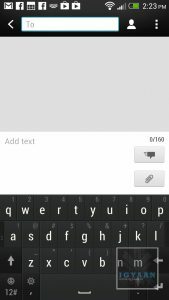 [pullquote_right]practicality and ingenuity[/pullquote_right]A lot of previous owners will complain at the removal of features of the past HTC Sense UI. But, the new experience is a great mix of practicality and ingenuity. 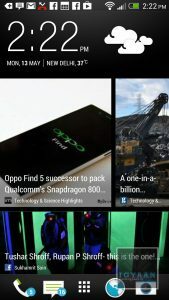 Blinkfeed on the HTC One is nothing more than an aggregator, it collects your favorite news streams, your Social Networks and even your connections to display them in a beautiful, seamless, Flipboard-esque interface which will also remind you of the Windows Phone UI. The information is clean and laid out quickly and beautifully, almost making you go back to it again and again. 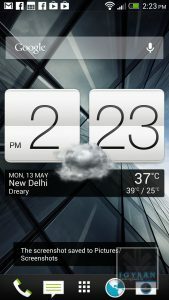 The other features of HTC Sense are also found in the UI, the Music App, Car Mode, Flashlight App, big chunky widgets and the oh so famous Weather / Flip clock widget are all there. 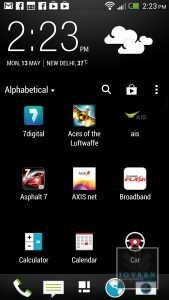 The HTC TV app is not currently available in India, and currently cannot be manually configured. The Power button does have an IR blaster inbuilt so it does function as a remote, but the functionality will be added at a later time. You should possibly be able download 3rd party apps to enable this feature soon. 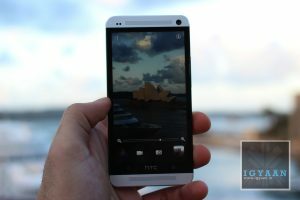 The HTC One has a gorgeous 1920 x 1080p display, and honestly it looks absolutely stunning, even outdoors. The LCD3 technology with an IPS panel and extremely high pixel density set it apart for the mix. 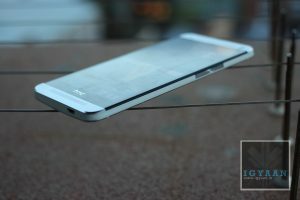 The Screen floats right on top with the touch panel, thanks to the fused display technology borrowed from LG, touching the HTC One feels like touching the elements of the display. 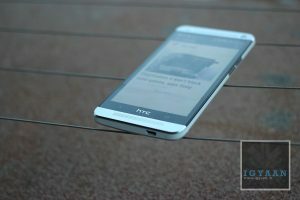 [pullquote_right]eliminates muffling[/pullquote_right]Watching Videos, playing games and other forms of media is fantastic thanks to HTC BoomSound, a wonderful thought of putting the Stereo Speakers in a forward facing manner, makes the audio extremely accurate and clear. It also eliminates muffling due to accidental finger touches and is easily heard especially while playing games. 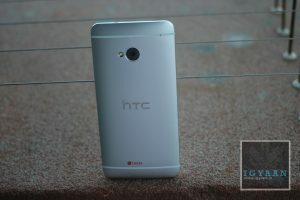 The HTC One also contains a FM radio which does require a headset to be connected for reception. Audio from the included earphones is absolutely great and in the history of in box earphones, these have to be one of the better ones if not the best. 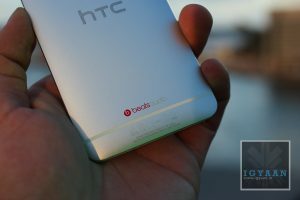 Beats audio is available throughout the array of hardware that you can connect to the Smartphone. The HTC One came out on top in terms of performance tests. The hardware is quite capable of handling all the tasks that you can throw at it with wonderful accuracy and flair. The chipset can handle, multitasking, heavy gaming and performance tasks with ease and still have power to calculate under formulas. Benchmarks for the early developer build beat all scores of the market at the time. For reference the latest build of the HTC One scores a fantastic 12030 on Quadrant, without tweaks of any kind. 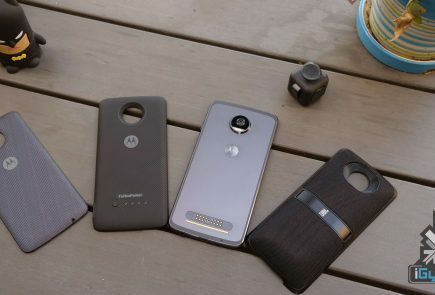 The phone does heat up a lot with extended use, which is normal for any smartphone, but the extended use of metals is what makes it uncomfortable to hold or even pocket. 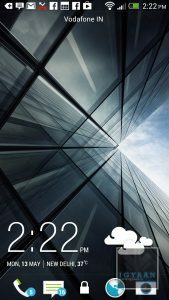 Battery on the HTC One is wonderfully managed by the interface, when not in use (aka; standby) the phone barely drains at all unlike other Android devices, the Blinkfeed can be configured to refresh manually to even improve battery life a tad bit more. Often times we found battery life to be good enough to go on into day two. 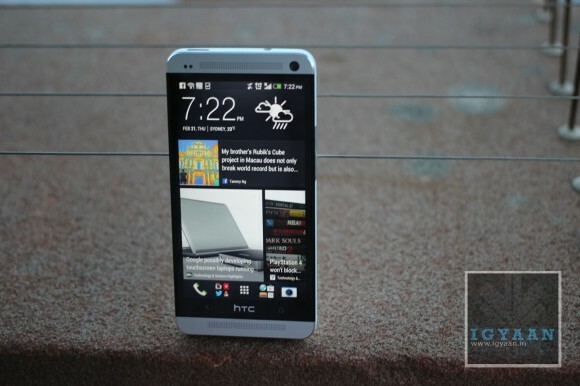 HTC has always been able to handle networks and phone capabilities in their devices, same is the case for the HTC One. The networks remained strong throughout and audio whether incoming or outgoing was crisp as ever. In our days of testing the phone, we had but only a few dropped calls, which can easily be blamed on the lack of network coverage. 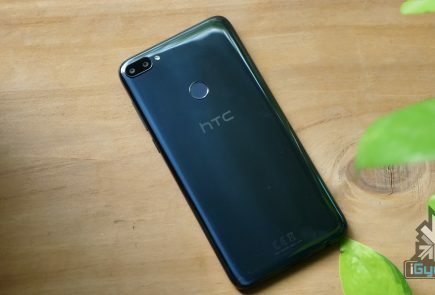 HTC has kept it usual features for phone capabilities, loud ringer in the pocket, flip to mute etc are all included making handling of phone calls an easy recipe. 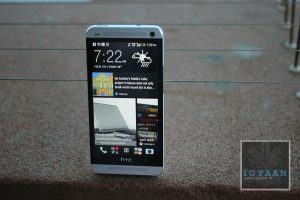 The HTC One is not a perfect smartphone, no smartphone is. 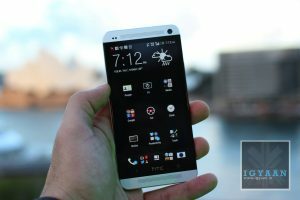 But the HTC One, comes as close as it can to delivering a perfect balance between many elements that make up todays smartphone. It is a flagship so it is priced high, but with that price it brings about a sense of achievement, a sense of ownership and pride. 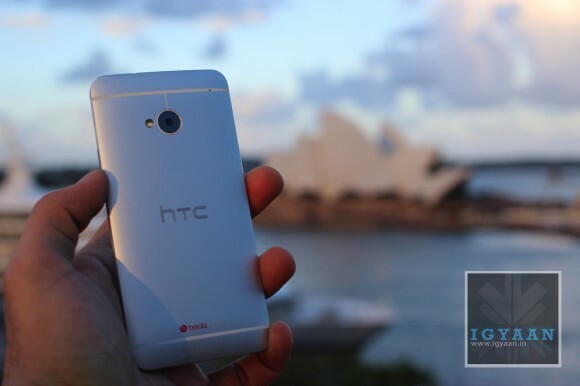 A mixed bag of feelings and emotions emerge when you hold and use the HTC One for the first time. Most people cannot stop themselves from passing a smile when they first handle this behemoth of a device. A great phone, a wonderful crisp display enabling a joyful multimedia device and a performance warehouse of the tech junkie. 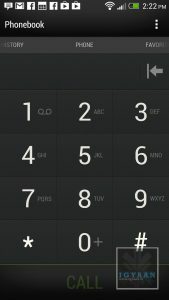 Sure it lacks a lot of software patches and gimmicks, but in entirety of usage it lacks almost nothing.